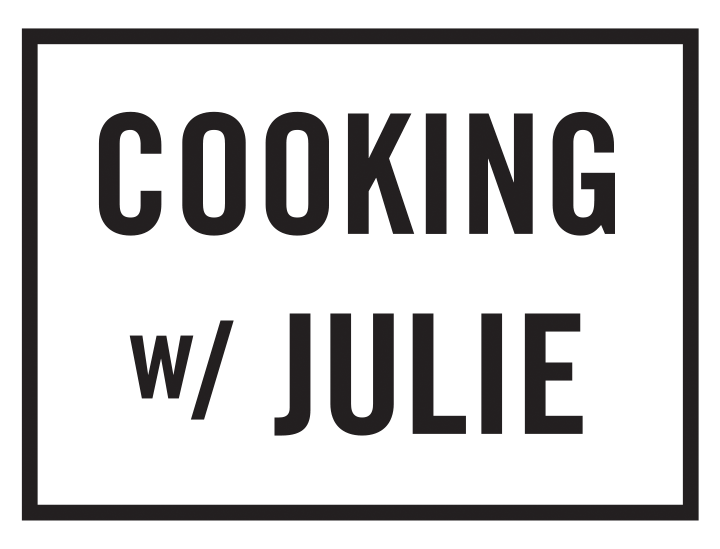 Welcome to the cookingwjulie.com website (“Juliemar Productions”, “the Site,” “we,” “us,” or “our”). Juliemar Productions provides this site as a service to its customers. Please read the following terms of service (“Terms”) as they govern your use of our site. By using this Site, you agree to follow and be bound by the following rule below. If you do not agree to these Terms, please do not use this Site in any way. Additionally, Juliemar Productions reserves the right, at its sole discretion, to modify or replace any of these Terms of Service at any time without prior notification. Site users must agree upon and abide by these changes accordingly. Please review this page periodically for changes. It is your responsibility to check the Terms of Service periodically for such changes. Any use of our Site at any time constitutes full acceptance of our service terms. Juliemar Productions is a strategic branding and design agency. We specialize in providing business and brand strategy, graphic design and marketing services to individuals, and businesses. We also provide business and brand consulting services and professional career coaching services. All of the content that appears on the Juliemar Productions web site, including all visuals, text, audio and video clips are subject to copyright protections and /or other intellectual property rights or licenses held by Juliemar Productions. The entire content of the Juliemar Productions web site is copyrighted as a collective work under U.S. copyright laws. Juliemar Productions grants you a limited license to access and make personal use of the content on this website. Content of the Juliemar Productions website is intended solely for the personal, noncommercial use by the users of our Site. Juliemar Productions may contact you or provide you with service-related and/or promotional notices by means of postal mail, electronic mail, general site notifications and more using the contact information you have provided to us. You cannot access or use the Juliemar Productions website for any illegal or unauthorized purpose. Harassment in any manner or form of the Site, including via e-mail and chat or by obscene or abusive language, is strictly forbidden. Although Juliemar Productions cannot monitor the conduct of its users, it is a strict violation of these Terms to use any information obtained from our Site in order to harass, abuse or harm another person, or in order to contact, advertise, solicit or sell to any user without his/her prior explicit consent. Also, you agree that no comments or other user submissions submitted by you to the Juliemar Productions website will violate any right of any third party, including copyright, trademark, privacy or other personal rights. You further agree that no comments submitted by you to the Site will be or contain libelous or otherwise unlawful, abusive or obscene material. You are and shall remain solely responsible for the content of any comments you make. Juliemar Productions strives to create an interactive relationship with the members of its Site and services. User comments, feedback, suggestions, ideas, and other submissions disclosed, submitted or offered to Juliemar Productions on or by this Site shall be and remain Juliemar Productions property. Users assign all property rights and interests to Juliemar Productions allowing our company unlimited use, commercial or otherwise, of any comments. Furthermore, Juliemar Productions shall be under no obligation (1) to maintain any comments in confidence; (2) to pay to users any compensation for any comments; or (3) to respond to any user comments. The information on the Juliemar Productions website may contain typographical errors, inaccuracies, or omissions. We reserve the right to update any information we see fit at any time without prior notice. Please note that such errors may relate to product information, pricing and availability. In these instances, we shall have the right to terminate any orders involving pricing errors or inaccuracies. We apologize for any inconveniences. By use of this Site, you agree to indemnify and hold Juliemar Productions (and its officers, directors, agents, subsidiaries, joint ventures, and employees) harmless from any claim or demand, as well as losses, expenses, damages and costs, resulting from any violation of these terms of service or any activity related to your account or usage of the website (including negligent or wrongful conduct). In the event of termination as a client, community member or website user, you will still be bound by your obligations under these terms of service, including the warranties made by you, and by the disclaimers and limitations of liability. Juliemar Productions shall not be liable to you or any third-party for any termination of your access. To improve our Site, Juliemar Productions may use and promote services provided by outside third parties. However, even if the third party is affiliated with Juliemar Productions, we do not control these services and make no representations regarding these persons or entities. We are not liable or responsible for the accuracy, completeness, timeliness, reliability or availability of, any such parties. Outside sites linked on our Site, all of which have separate privacy and data collection practices, are only for your convenience and therefore you access them at your own risk. Juliemar Productions is a participant in the Amazon Services LLC Associates Program, an affiliate advertising program designed to provide a means for us to earn fees by linking to Amazon.com and affiliated sites. ALL CONTENT, PRODUCTS, AND SERVICES ON THE SITE, OR OBTAINED FROM A WEBSITE TO WHICH THE SITE IS LINKED (A “LINKED SITE”) ARE PROVIDED TO YOU “AS IS” WITHOUT ANY GUARANTEES OR WARRANTY. IN CONNECTION WITH ALL CONTENT, PRODUCTS AND SERVICES ON THIS SITE, Juliemar Productions MAKES NO WARRANTIES OF ANY KIND, EITHER EXPRESS OR IMPLIED INCLUDING, BUT NOT LIMITED TO, THE IMPLIED WARRANTIES OF MERCHANTABILITY AND FITNESS FOR A PARTICULAR PURPOSE, TITLE, NON-INFRINGEMENT, SECURITY OR ACCURACY. USE OF THE PRODUCT BY A USER IS AT THE USER’S RISK. Juliemar Productions SHALL NOT BE LIABLE TO YOU FOR ANY DIRECT, INDIRECT, INCIDENTAL, SPECIAL, CONSEQUENTIAL OR EXEMPLARY DAMAGES THAT RESULT FROM THE USE OF, OR THE INABILITY TO USE, THE MATERIALS AND SERVICES ON THIS SITE OR THE PERFORMANCE OF ANY ITS PRODUCTS (EVEN IF Juliemar Productions HAS BEEN ADVISED OF THE POSSIBILITY OF SUCH DAMAGES).